Net attaches directly to cables that run from wall to wall. Net slides easily against the wall for storage. Consists of (3) 100 ft. rolls of 1/4" galvanized aircraft cable, plus all necessary hardware. 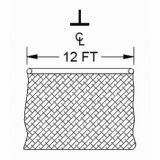 Batting cage frame with net and wall mounting kit available separately. Maximizes your over-head space when net is in stored position. Allows support cables to be placed higher in the ceiling, up to 30 ft. Net is suspended on 1/8" aircraft cable every 3 ft. on center. Batting cage frame with net and wall mounting kit available separately. 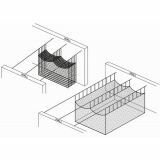 Direct Attached: For cages centered directly beneath a beam or bar joist (system will be attached directly to single beam or bar joist). 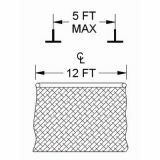 Batting cage frame with net available separately. 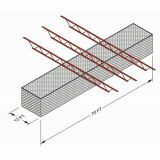 Spanning Parallel 5 ft. on center or less: For cages whose centerline is located between two beams or bar joists that are spaced 5 ft. apart or less. Batting cage frame with net available separately. 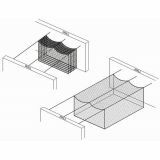 Spanning Parallel 5 ft. to 8 ft. on center: For cages whose centerline is located between two beams or bar joists that are spaced greater than 5 ft. but not over 8 ft. apart. Batting cage frame with net available separately. Spanning Perpendicular not greater than 8 ft. on center: For cages oriented perpendicular to beams or bar joists that are spaced no greater than 8 ft. apart. 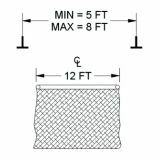 Batting cage frame with net available separately. 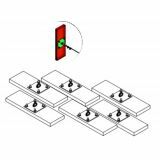 (6) finished wood pads and steel mounting plates to attach to concrete, block or steel framed walls. Wall anchors not included. To be supplied by installer depending on wall specifications.